Pond was a shoemaker's son, the oldest of eight children. He fought in the French and Indian War and started fur trading along the Mississippi River afterward. But when the American Revolution broke out, he found himself more interested in the lush pelts to the north in British Canada than fighting for his homeland. By 1778, he had a trading post further west than any white man of his time, on the Athabasca River in the watershed of the Arctic and Pacific Oceans about 500 miles due north of present day Montana. A rough, intimidating, hulk of a man with short temper, he was held in awe by both white men and Indians. He made the first crude maps of North America west of Hudson's Bay and was a founding partner of the Northwest Company that had vicious competition with the Hudson Bay Company before the latter swallowed the former in 1820. He was implicated in two murders in the wild north, one for which he was never convicted, the other committed by followers for which he was blamed. That murder had him replaced in his post by Alexander Mackenzie to whom he had to explain the surrounding tribes and terrain. One aspect intriguing Mackenzie was Pond's belief that a nearby river stretched all the way to the Pacific, the likely mythical Northwest Passage. After Pond left Canada in 1788, Mackenzie canoed that river which ended up in the Arctic Ocean, but later assumed his name, the Mackenzie River, second longest in North America. Mackenzie tried another nearby river in 1793, and after several more rivers and an overland trek, became the first white man to hit the Pacific by land across North America. This was 12 years before Lewis and Clark. Mackenzie wrote a book on his travels, was knighted, and died a rich man. Pond died in poverty in Milford without a headstone. Pres. Thomas Jefferson read the Mackenzie book, decided USA should have a presence out there before the British got much further, and launched Lewis and Clark. Pond was the first white man to descend the Clearwater River toward setting up his Athabasca post. To reach the westward flowing Clearwater, he was the first white man to cross the arduous 12-mile Methye Portage which took him a week with 16 men and four canoes. That portage was used another 100 years until trains made travel more practical. Today, Fort McMurray, Alberta, at the confluence of the Clearwater and Athabasca, has a school (since closed and demolished), hotel and shopping center named after Pond. In neighboring Saskatchewan, there is Peter Pond Lake just south of Methye Portage and a Peter Pond Monument in the city of Prince Albert. 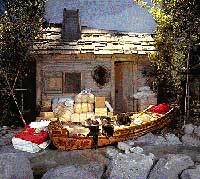 A small scale birch bark canoe containing pelts and trade goods of the fur trade. Actual 18th and 19th century commercial canoes were of two different sizes. The 36-foot Montreal canoe transported goods and furs from Montreal to the Grand Portage post at the western end of Lake Superior. The 25-foot North Canoe was shorter for use further inland on the smaller lakes and streams. Classic paintings of such canoes in action by Frances Anne Hopkins can be found under links.